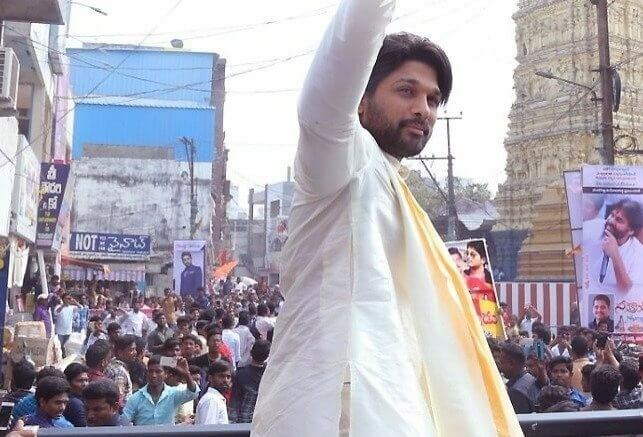 The Tollywood Stylish star Allu Arjun is celebrating Sankranthi in his home town Palakollu in West Godavari district of Andhra Pradesh. Allu Arjun received a roaring welcome from fans as soon as he reached Palakollu from Rajahmundry airport on Sunday. Earlier today, Allu Arjun visited Ksheera Ramalingeswara Swamy temple, one of the Pancharam Kshetrams, located in Palakollu. Speaking to media, Allu Arjun donates 10 lakhs to temple treasury for construction of Mandapam. Stylish star Allu Arjun said Palakollu is his birthplace and will always remain close to heart. He also promised to continue his donations for his hometown for a good cause and also wished to celebrate Sankranthi here every year. Allu Arjun is one of the most followed actors in South Indian cinema. An ocean of fans was witnessed at the airport after his arrival and they even followed his car. Allu Arjun grandfather Allu Ramalingaiah was born and brought up in Palakollu. Actor Allu Arjun also shared few pics on his social media sites which he clicked with all the relatives on the terrace of one of their relative’s house.